Hey, remember that dress that the internet went completely insane over? The one that some people swore was white and gold, but other were defiantly certain was blue and black? Well, it turns out the Star Wars universe has its own version of the dress — specifically, Han Solo's coat from Empire Strikes Back. Look at the above still from Empire. I'm very confident some of you will see it as brown, and some as a deep, navy blue. Certainly, the io9 staff is divided on the issue (I'm a blue man here, although the dress was clearly white and gold). And it's actually a controvesry that has raged through the decades, from Empire's initial release! 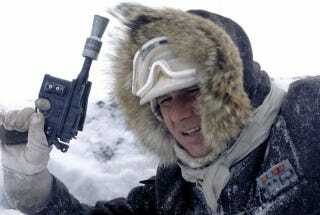 In fact, it was big enough that it forced Hasbro to release two versions of the Han on Hoth action figure — one in each color. ...but this last one is 100% navy, I don't what anybody says. So that little Attack of the Clones bonus feature can claim whatever it wants to. Clearly, someone at Lucasfilm or Disney is in the pocket of Big Brown, and as a True Blue supporter, I refuse to believe their lies! Please feel free to acknowledge the truth or rave like a lunatic in the comments. Your preference!